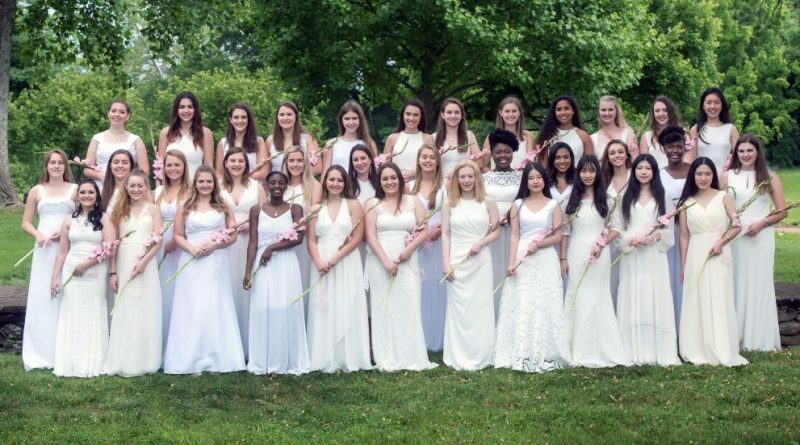 Neither rain nor mud could dampen the joy in Miss Charlotte’s Garden Friday morning when 35 girls representing five countries, 10 states, and the District of Columbia received their diplomas at Foxcroft School’s 103rd Commencement. After a week of nearly non-stop rain that left the garden more than a bit marshy, sunshine appeared early Friday, before giving way to showers as the 10am ceremony began. “Walking through the Garden,” however, is a beloved rite of passage for Foxcroft graduates which this year’s class was not going to miss. Undaunted, students and faculty processed through the mud with pride. Mary Louise Leipheimer, a veteran of many Foxcroft commencements whose final year as the School’s Head (2013-14) was the graduating class’s first as students, delivered the invocation without missing a beat. Then, to ensure that the focus remained on the graduates’ achievements, Head of School Catherine S. McGehee decided to shuffle the program to award prizes and diplomas first, ahead of the speeches in case the rain forced an early conclusion. Instead, the precipitation ceased as Foxcroft Board Chair Anne Michele Lyons Kuhns ’87 and McGehee handed out the diplomas and Senior Class Speaker Jacina Hollins-Borges and English Department Chair Anne C. Burridge, who gave the Commencement Address, had their time in the sun (literally). The Class of 2017 is an impressive one. It includes four National Merit Scholarship Commended Students and 11 AP Scholars and collectively the 35 members of the class were offered more than $2.1 million in merit scholarships and 140 acceptances to 90 colleges and universities, including Cornell, Emory, Georgetown, Pratt, St Andrews (Scotland), University of Toronto, (Canada) William & Mary, and the University of Virginia. Valedictorian Isabella Zimmerman of Fairfax, VA, who plans to attend Georgetown University’s School of Foreign Service this fall, earned Pillsbury Prize honors. Salutatorian Lindsay Woods of Philomont, VA, won the coveted Charlotte Haxall Noland Award for best combining the qualities that Foxcroft’s founder valued: high purpose, leadership, integrity, accomplishment, and understanding. She has been accepted into the St Andrews William & Mary Joint Degree Progamme. Emily Dietz (Unionville, PA; University of Maryland College Park Scholars) received the Dudley Prize as the senior who has been most willing in her unselfish efforts for the good of the school. Virginians swept the remaining senior awards as Elle Lassiter of Round Hill (University of Richmond) received the Josie Betner Mallace Prize, and Upperville residents Leland Burke (University of Mary Washington) and Sofia Tate (Georgetown) took the Ida Applegate Award and Head’s Prize, respectively. Junior Yiming Zhao (China), sophomore Ngoc Nguyen (Viet Nam), and freshman Kenzie Green (Leesburg, VA) received the top prizes for their classes, and Elisa Chen (China) earned the Junior Award for Scholarship.